Attempting a Guinness Book of World record for playing ice hockey at the highest altitude, a two-day tournament was organised from February 5 to 7 at Chibra Kargyam. A total of six teams including five international and one local team participated in the tournament. The participating teams were, Rainer all Stars, Tatra Eagles, Randstads, Geronimo, Hockey Foundation, Team Ladakh. The tournament was jointly organised by Ladakh Winter Sports Club, Hockey foundation, and Lalok Winter Sports Club. The opening match was played between hockey foundation and Team Ladakh in which hockey foundation won the match. Nearly 100 ice hockey players from five western countries, some of them from reputed professional teams participated in the three-day ice hockey match. Over 90 players from USA, Canada, Germany, France and Slovakia participated in the three-day ice hockey tournament. 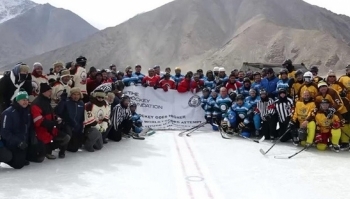 Lundup, General Secretary Lalok Winter Sports Club said, “It is for the first time that international level ice hockey was played in Ladakh and we particularly the people of Lalok feel proud. At the local level, we along with Winter Sports Club Leh made every possible support to make this match a success at such a high altitude". He further added that the equipment and set of boards for rink were brought from outside making the international level ice hockey rink at an altitude of 1400 ft and it is a historical event. "It's great that the local players got exposure and experience playing with these professional teams," he added. Chibra is a village situated about 160, Km away from Leh, which could be reached after traversing world’s second highest motorable pass Changla 17,000 ft.